In an effort to switch things up and get you, my readers, more involved, I have brought in a great person to hopefully shake things up here. I want to introduce Dr. Frank J Sileo. Dr. Frank J. Sileo is a New Jersey licensed psychologist and is the Founder and Executive Director of The Center for Psychological Enhancement, LLC located in Ridgewood, New Jersey. He works with children, adolescents and adults. He received his Doctorate in psychology from Fordham University in New York City. He received his Master of Science degree from Fordham University and his Bachelor’s degree from Iona College in New Rochelle, New York. Dr. Sileo has been in private practice in Ridgewood, New Jersey since 1995. Since 2010, Dr. Sileo has been consistently voted one of New Jersey’s Favorite Kids’ Docs by readers of New Jersey Family magazine. Dr. Sileo is an award winning author and an active public speaker. He is the author of five, soon to be seven children’s picture books: Toilet Paper Flowers: A Story for Children about Crohn’s Disease, Hold the Cheese Please! A Story for Children about Lactose Intolerance, Bug Bites and Campfires: A Story for Kids about Homesickness, Sally Sore Loser: A Story about Winning and Losing and Don’t Put Yourself Down in Circus Town: A Story about Self-Confidence. Sally Sore Loser is the recipient of the Gold Medal Award from the prestigious Mom’s Choice Award. His sixth children’s book, to be released in February 2017 is on teaching mindfulness to kids. His seventh children’s book on a type of bullying will be released in the fall of 2017. He has written extensive general interest articles and has been quoted numerous times in various local and national newspapers, magazines, podcasts, websites, radio and television. Dr. Sileo will be posting on here from time to time. 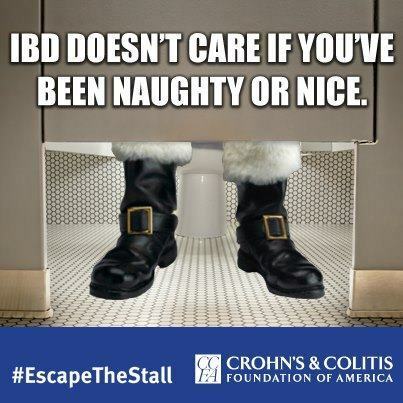 You may be wondering what makes him qualified to talk to you about IBD. Well, that is easy to answer. He is a Crohnie. He has also on the board of CCFA in NJ and nationally. He speaks across the country for CCFA on the psychological effects of IBD on patients and caregivers. Let’s welcome Dr Frank Sileo aboard and feel free to leave a comment if you want him to discuss anything specific. Wow, it has been awhile since I posted anything. I am sorry for that everyone. Life has been real busy, especially at work. A lot of good things are happening though so even though I am busy, it is a good thing. I recently started working with The Intense Intestines Foundation (www.intenseintestines.org). I don’t want to say just yet what I am working on but I will definitely reveal that in a couple of months once all the details are worked out. I will say it has to do with supporting others with IBD and I can not wait to get started. I also have been working with The Crohn’s Journey Foundation (http://thecrohnsjourneyfoundation.org/). Again I can’t say just yet what it is I am working on but that will be revealed next month if all goes well. So how was everyone’s holiday season? Did you have fun and do anything special? I know a lot of people I talk to online spent it in the hospital. Myself, I spent it on a cruise down south. My wife and I took a Christmas cruise to Florida and the Bahamas. 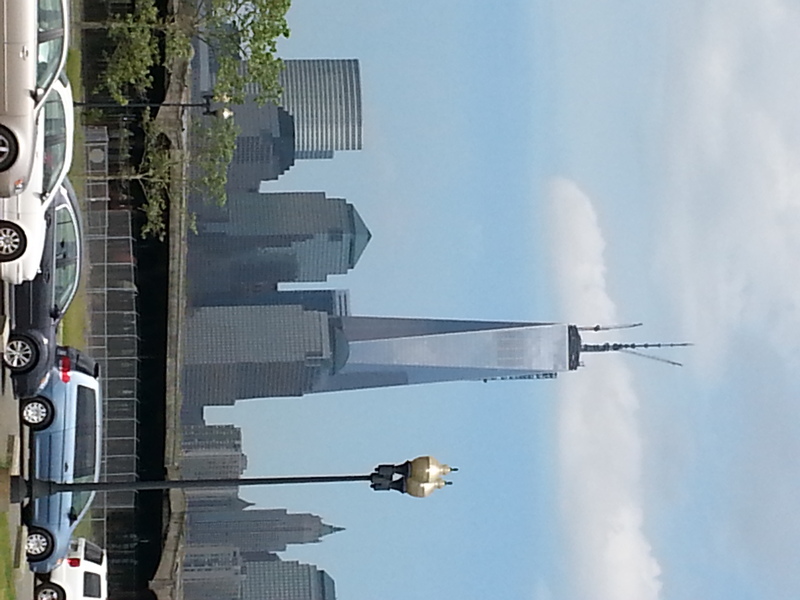 It was reflecting on the cruise that got me to write this blog. I was wondering how many of you with IBD find it hard to travel and go somewhere? This was my first cruise where I am gluten free. We had done some research and had read that there would be plenty of options for food for me. I really didn’t worry about it. I should have. My first clue was when we first got on the ship and went to lunch. The only thing listed as gluten free was the mashed potatoes. Good thing I know what normally has gluten in it so I was able to play it safe. This theme of lack of gluten free items would carry on throughout the cruise. Most of the desserts were not gluten free. I started to get annoyed because the reality is that it isn’t hard to do. They did have GF bread and it was ok. My dinners were altered to be GF and I was happy for that. But for desserts, they could have made a flourless chocolate cake. I am sure many people would eat it. Overall, I had fun on the cruise. We went to Cape Canaveral in Florida, Nassau Bahamas and their private island in the Bahamas. I was lucky and had no major issues with my Crohn’s. I was able to go out and have some fun. I even was able to indulge in a little alcohol…ok…it was more then a little. I did worry at times that I might have some problems but luckily my guts stayed quiet. I would like to know what some of your tricks are travelling. Do you pack extra clothes? Do you take certain meds to calm the guts? I remember take Lamodal on one cruise about 3 years ago. I helped me enjoy myself and gave me a life off of the toilet. Thankfully, I didn’t need it this time around. Well, vacation time is over and it is a new year. I think this is going to be a great year. I myself am working on so many IBD related things. Besides IIF and TCJF I will be working with GYGIG again in June. 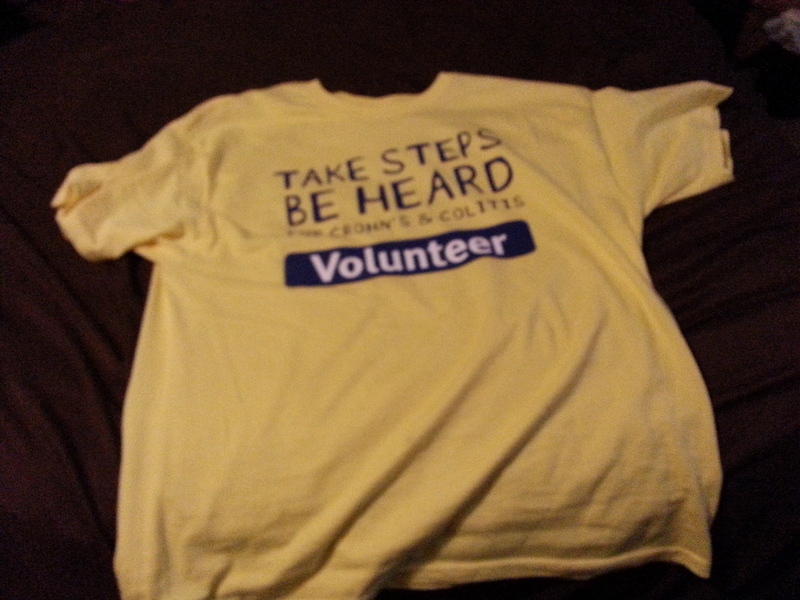 I might do the CCFA Takes Steps this year. So much to look forward to this year. I hope to post more often and will let everyone know about everything that is going on. I do want to say that if you live in the NYC tri state area, we have some good things for you this year. But that is another post for another time. 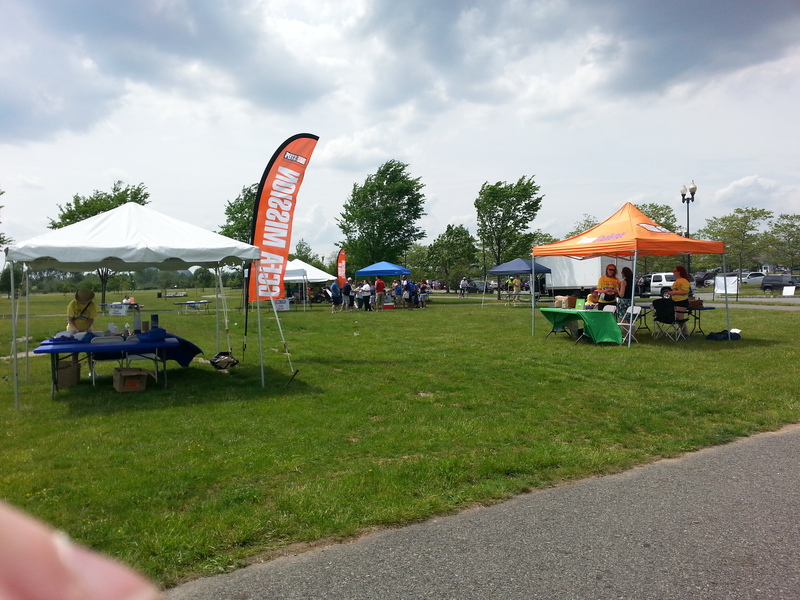 Yesterday I participated in the Take Steps for Crohns and Colitis which is run by CCFA. Better yet, I volunteered. Last year I was wiped out from walking so I decided this year I would help out instead. Ok, that took its toll on my body even more. Today my back and neck are achy and my feet are sore. But it was soooo worth it. One thing I like about the walk is the location. 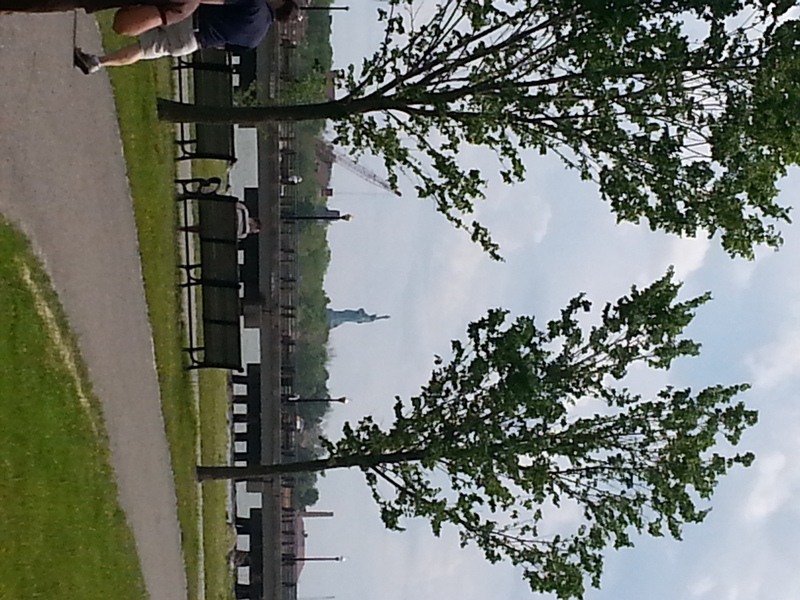 I was helping out at the Liberty State Park walk and the views from there are breathtaking. After I take this in I head over to my assigned area, the food tent. This year I decided to put my talents to use. 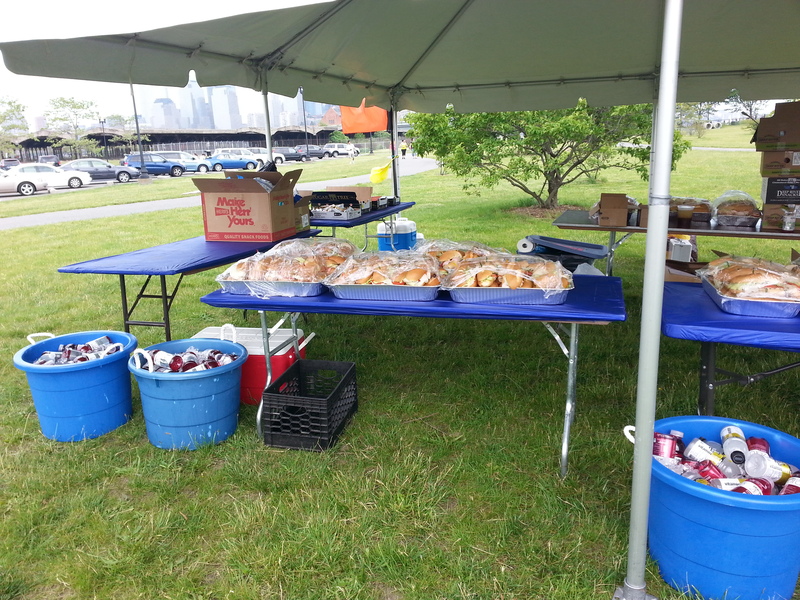 I helped get donated food for the walk. 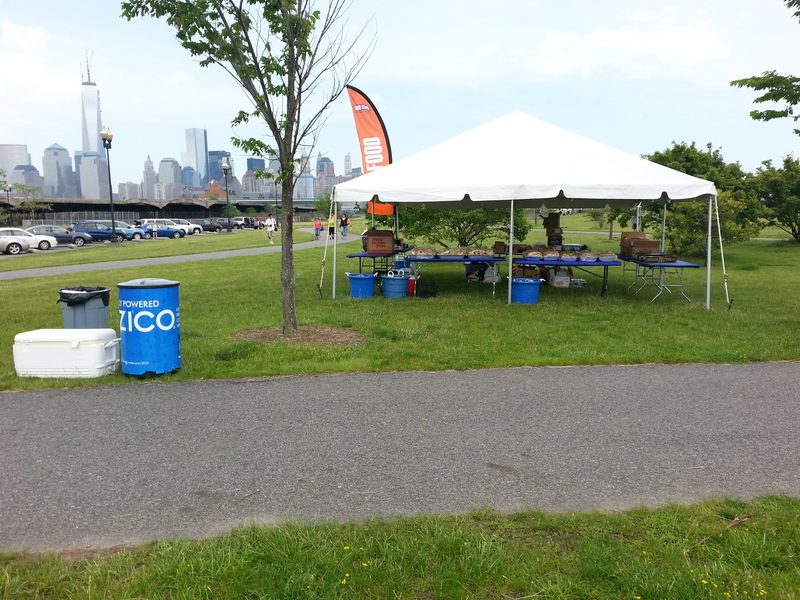 I was able to get some coconut water, vitamin water, Smartwater, fruit and chips. After we got set up, I decided to look around before it got real busy. 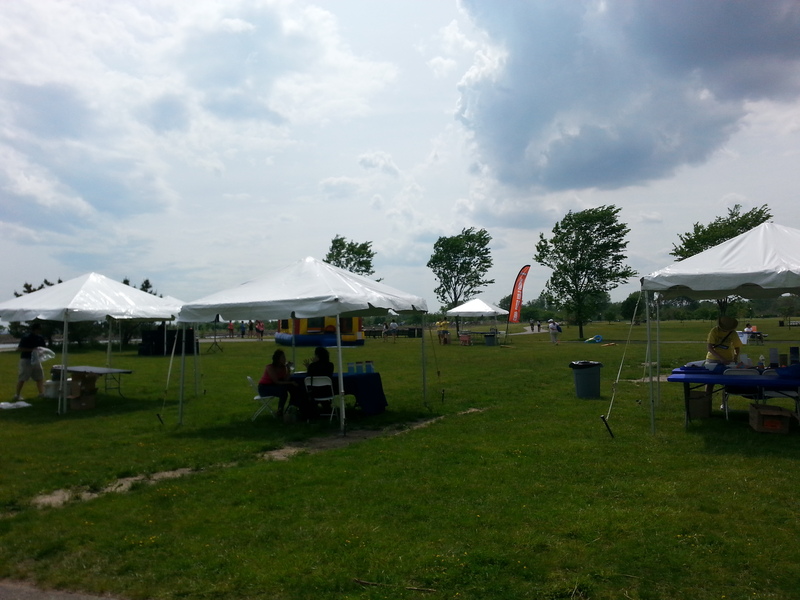 There were tents for some drug reps (Humira, Remicade), Team Challenge sign ups, the Kids Corner with bouncy house, and the DJ. All was quiet before the storm. As you can see from the pictures, it looked like a storm was coming but luckily, the rain held off. The wind was pretty powerful though. With the almost 90 degrees and humidity, the wind was refreshing. At 4:00, the walkers were off for a 2.15 mile walk. When they came back that was when the real fun began. Our tent got mobbed. 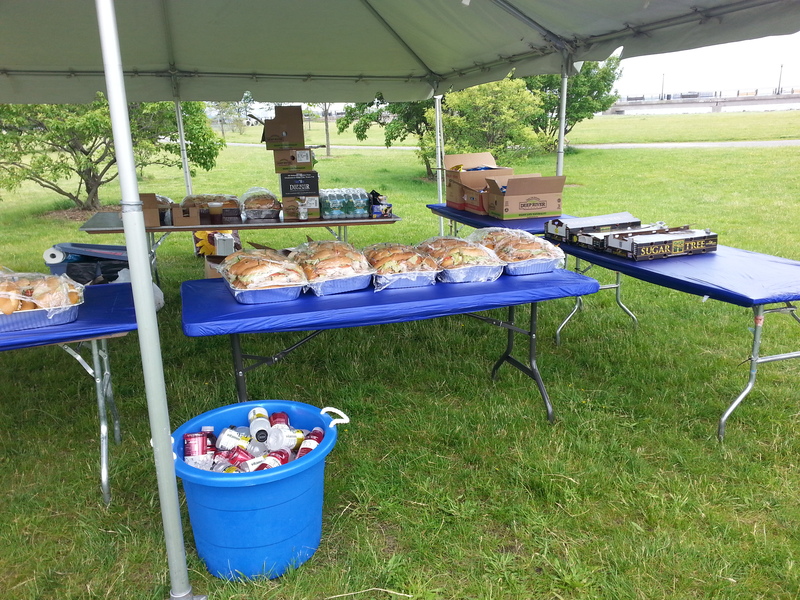 Aside from what I brought, we also had sandwiches, cookies, granola bars, orange juice and spring water. Pretty much everything went. One thing I have noticed about these walks, and it disturbs me a little is that everyone chats but no one really talks about the disease …. which is why we are all here. I was talking with one of the volunteers and he asked why I was there. I mentioned I had Crohns. He said his son has Crohns and that was it. No further discussion. It really hit me that although everyone comes out to bring awareness and come together, no one really wants to talk about it still. My only conclusion is because it isn’t just the patient but friends and family there also that they don’t feel like opening up. I can understand that. This up coming weekend is Get Your Guts in Gear. I know a lot of the volunteers that will be there. I know we will be talking about it a lot more but we will also have fun and talk about other things. 2 weeks and 2 awareness events. It is enough to tire these old bones. After the walk, I feel achy. Hate to see what next week brings. Stay tuned for a recap.